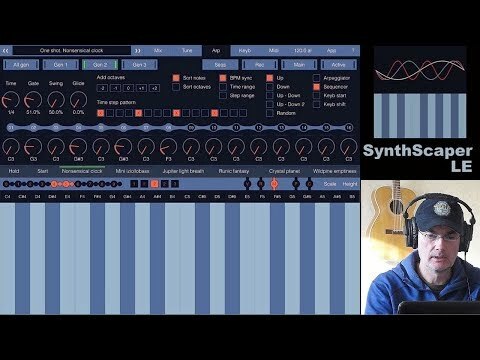 The sound engine of SynthScaper has its own unique sounding differ from any other software synths. You can construct outstanding melodic pads or atonal soundscapes from different kind of built-in or downloaded samples by using all power of multi-layered oscillators, chains of filters and effects, envelope generators and low frequency oscillators. SynthScaper Tutorial: Part 1 - A moderately detailed walkthrough of the main features of SynthScaper on iOS. SynthScaper Tutorial: Part 2 - Digging deeper with SynthScaper. Looking at: (1) LFO setup, (2) Using Effect 1 and Effect 2 virtual controls to modulate multiple simultaneous parameters, and (3) Dissecting some presets to get inspiration.